Did you know that Pope Leo XIII, was supported in his ascetic retirement with frequent dosages of Vin Mariani, the celebrated wine of coca? And that other noted enthusiasts included Thomas Edison, Emile Zola and Jules Verne? However brilliant and celebrated were these individuals (and others like them), they had to conduct their interior exploration without tguides and, usually, with scant reliable information. Now, for the first time, the modern explorer (or interested observer) has a book to turn to! 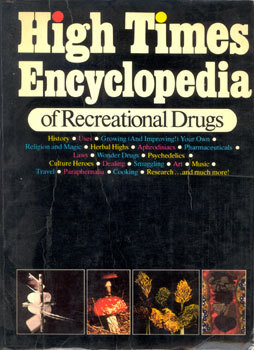 The High Times Encyclopedia is the first comprehensive, authoritative and unbiased sourcebook and guide to the so-called "recreational drugs" including cannabis and its derivatives, psychedelics, cocaine, pharmaceuticals, herbs, alcohol, tobacoo and a lot more! More than three years in preparation by the editors of High Times magazine working with leading doctors, scientists, scholars and writers, the Encyclopedia is essential, fascinating, factual . . . . a clear step in the direction of greater understanding for millions upon millions of people.